When I have the opportunity to spend an afternoon by myself, it usually involves a glass of wine and a cheese plate. That is how I found myself one Saturday afternoon, enjoying a conversation in a mix of Japanese, French, and English, sitting at the bar of a lovely restaurant called Apéro in Minami Aoyama. At Apéro, I always enjoy the expertly selected biodynamic French wines, lively decor, and ingredients scavenged with a higher level of consciousness. Every single item on the menu, shared with guests on an iPad, includes numerous wine pairing recommendations from their collection. Visit regularly for events featuring local Japanese producers, artists, or guest wines from France. On Sundays, Apéro fills up for their multi-course brunch with an option for free-flowing champagne (don’t have to say that twice). Families, couples, and groups of friends delight in a slow morning ritual and a good conversation. But really, The Geography of Cheese looks at one special part of the menu - the cheese plate. Co-owner Guillaume Déperier answered a few of my questions about their cheese plate and made me an even more devoted fan of Apéro and everything they stand for. Check out their profile on The Geography of Cheese here and read the interview below. Once you do, I’m sure you’ll discover a few hours open for a Sunday champagne brunch or an evening aperitif at Apéro. You’ll probably find me there with a glass of wine, slowly contemplating some cheese. You have a cheese plate on the menu at Apéro, how do you choose your cheeses? Do you change the cheeses regularly? By season or with a pattern? We always try to have an array of cheeses including Comté, truffle gouda, Roquefort, and goat or sheep cheeses. Seasonally, we will include Mont d’Or or Beaufort from France or domestic cheeses like Sakura from Kyodogakusha. Is the cheese plate a popular choice at Apéro? More with the Japanese or foreigners? The cheese plate is in the top 4 for sales at Apéro and is equally popular with Japanese guests as with foreigners. Where do you get your cheeses? Imports, stores, cheesemakers, etc. We purchase our cheeses in 2 different ways, working with Via the Bio, an importer of organic European cheeses. Via the Bio is a great company that is willing to work with us to find cheeses we are interested in like the truffle gouda that they don’t usual import. For many domestic cheeses, we communicate directly with Japanese producers like Kyodogakusha in Hokkaido. What is your impression of Japanese cheese? I am very impressed by cheesemakers like Miyajima-san from Kyodogakusha, because he makes many different types of cheeses that are all high quality. While in France, we tend to specialize in one of two types of cheeses at each farm. Do you know many Japanese cheeses? Do you like any in particular? I particularly love Sakagura, a soft washed-rind cow’s milk cheese washed with Japanese sake from the Tokachi region. It looks like Alsatian Munster and is very rare, with only 8000 wheels produced each year. It is also served on the Japan Airlines First Class cheese plate. Many of our customers ask for it when they come to Apéro. 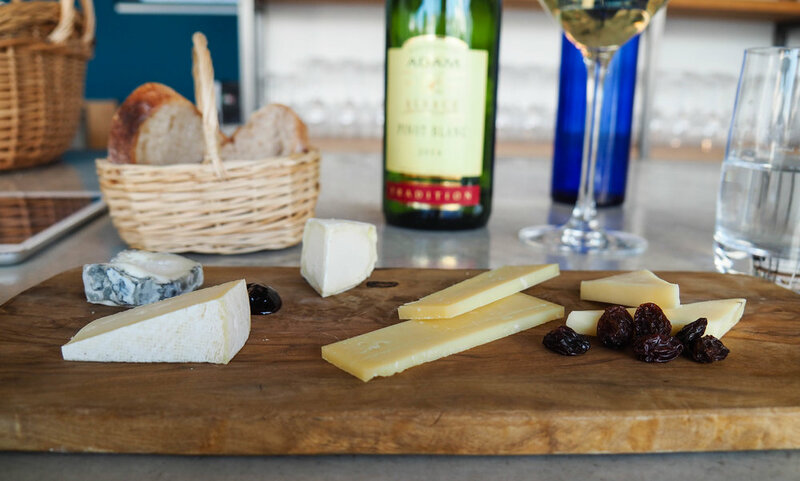 Is there anything else you’d like to share about cheese at Apéro? We also make an effort to regularly offer cheeses from my region in France—Beaufort, Abundance, Saint Marcellin, Mont d’Or, Saint Félicien, Reblochon, Chevrotin des Aravis, as opposed to Brie, Camembert de Normandie, etc. The Japanese are less used to eating cheeses from the south of France and Apéro’s cheese plate is a great opportunity to introduce them to guests. Check out more information on Apéro at the link below.